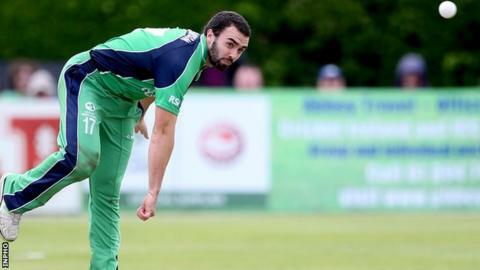 Ireland all-rounder Stuart Thompson has been ruled out of the Intercontinental Cup match against Papua New Guinea after injuring a foot. Max Sorensen replaces Thompson - who accidentally stood on a bottle, which broke - for the match in Townsville, starting on Sunday. Netherlands top the table, with Ireland six points behind in second. Pace bowler Boyd Rankin will make his competitive return for Ireland after his switch back from England. Rankin's last competitive appearance for Ireland came four years ago and he is relishing making a comeback in Australia. The Bready man took 1-29 in his 11 overs for the Irish in a two-day practice match against Queensland earlier this week. "I've really enjoyed being back in the Irish environment. I've been made very welcome, and settled in very well - it doesn't seem like I've been away at all," said Rankin. "It was a little strange the first time I pulled the Irish jersey back on for the two-day game, but I settled quickly and felt very comfortable and excited to be back playing. "The pitch will be pretty similar to what we have been practising on in Brisbane. We are predicting a slow flat wicket with hopefully some turn later on in the game. "Townsville is very hot and humid so it will be tough conditions for us. but our preparations have gone very well. All the bowlers have got a good run out in the last few weeks and are fit and raring to go come Sunday." Thompson sustained a small laceration to his left foot and Ireland are hopeful he will be available for two Twenty20 games against Papua New Guinea early next month.